My Schnitzel and Boo Mini Quilt Swap quilt is finished! I am so pleased with how it turned out. The quilting in the negative space is my favourite part. 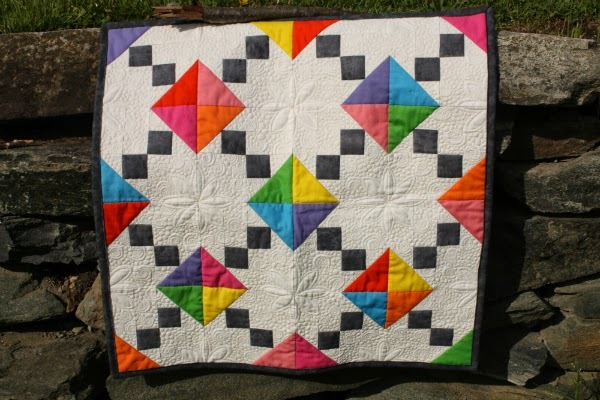 The quilt is 24" square, made of four 'Spin Cycle' blocks designed by Gudrun Erla and published in Volume 9 of Quiltmaker's 100 Blocks. I'm working on a bookmark using some of the leftover solids, so once I get that finished I'll be ready to put this in the mail. Then I need to order the fabrics I have picked out to make a version of this quilt for us, and start stalking the mailbox for the swap quilt made for me! Beautiful quilting detail in the negative space! Congratulations on the beautiful finish! Hard to believe that you made this beauty for a swap. The quilting is amazing. Yay....a finish!! The quilting is fantastic. Wowsers! Your swap partner is quite fortunate. Your swap partner is going to love that quilt! It's beautiful. I love the bright, cheerful colors you chose. I'm sure the swap partner will love this! Gorgeous quilting, and way to utilize the negative space. What a wonderful mini quilt! The quilting is just lovely! 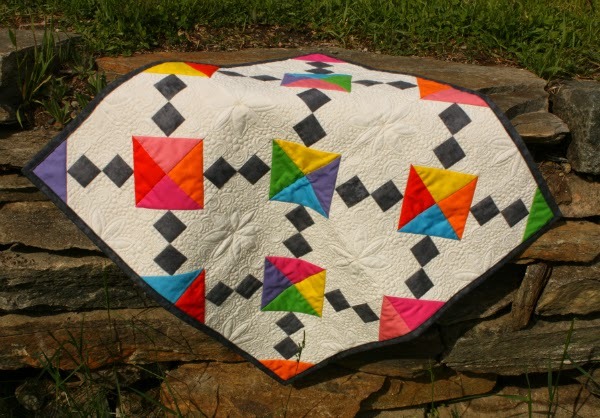 Super gorgeous quilting....your partner is going to love it! I love the quilting in this quilt. Thank you for sharing! I've so enjoyed seeing you work on this one. I adore the quilting on it, its stunning!! Nice finish! You quilting is beautiful! Lucky swap partner to get something this lovely!